The Data Protection Act 1998 is extremely important and ensures that individuals data is not being used, processed and distributed in an improper or harmful manner. 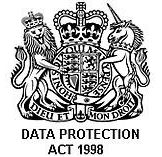 Every individual person & business that handles, processes or holds personal data must be responsible to abide by the Data Protection Act 1998. Further information can be found in relation to the Data Protection Act 1998 on the Information Commissioners Office website by clicking here! DataSpace are the document management specialists and are registered as a Data Controller due to our nature of business – Document Management Provider.